To celebrate National Volunteer Week 2006 Volunteering Highland Caithness hosted a Volunteer Award Ceremony in Wick town Hall on Tuesday 6th June attended by representatives of the voluntary sector and family members. 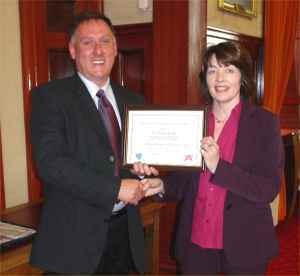 MV Youth Volunteering certificates were presented by Councillor Bill Fernie to 11 young people from around Caithness. A total of 6 Bronze, 3 silver and 2 gold certificates were gained by young people volunteering with a range of voluntary organisations from i.e., sport, charity shops, uniform groups and the care sector. 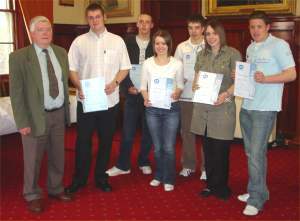 MV awards are endorsed by the Scottish Executive in recognition of the excellent work done by 16-25 year old volunteers. Currently 62% of all registered volunteers in Caithness are under the age of 25. Additionally, Mr David Steven was in attendance to receive an Employer Supported Volunteering Award which was presented to D Steven & Son haulage contractors by Catherine Patterson Development Officer for Volunteering Highland. This award was presented to Mr Steven in recognition for his company’s outstanding contribution to the voluntary sector in Caithness. Almost 1.52 million adults volunteer formally and informally on a regular basis in Scotland. The adult population of Scotland (16 years and over) is around 4 million. How many people in Scotland volunteer? What do Scotland’s volunteers do? An increasing proportion of Britain's 22 million volunteers are supported by their employer, either in work time or outside of work hours. This is known as Employee Volunteering.